Evergreen shrub or small tree up to 1-10 m tall; mostly glabrous, young shoots softly hairy. Leaves greyish-green, 3-foliolate; leaflets on a short stalk (petiole), petiole mostly longer than leaflets, glabrous to denseley hairy. Flowers lemon-yellow or greenish-yellow, with a projecting greenish or purple beak; calyx often tinged purple; in many-flowered racemes to 400 mm long. Flowers from spring to autumn. Fruits greenish-purple pods, inflated, to 100 mm long, seeds loose in dry pod. Native to Tropical East Africa and North-East Africa (Tanzania and Kenya). In South Africa it is present in Gauteng, North West, Limpopo, Mpumalanga, and KwaZulu-Natal province. It is invasive also in Australia (New South Whales) and in Hawaii. It reproduces mainly by seeds. These become loose in the pod as they mature, and rattle when the pod is shaken. This is characterstic of the genus Crotalaria. Canary bird bush was introduced in South Africa as an ornamental plant. It is believed to have escaped cultivation. The earliest record in the Pretoria National Herbarium is of a specimen collected in Johannesburg area at the Railway Horticulture Garden in 1921, and in Cape Town, Newlands in 1960. Currently it is most prominent in Gauteng. The earliest record of its establishment in the wild is from Rustenburg to Brits. It has also been recorded in nature reserves such Faerie Glen and Wonderboom Nature Reserves. It threatens watercourses in grassland and savanna biomes; potentially invasive on forest margins and also occupying cleared grassy areas. Currently there are no herbicides registered for this species in South Africa. It can be physical controlled by uprooting the plant before it can form seeds. Report citings of these plants to the Early Detection and Rapid Response Programme (EDRR) team. We will need to know its locality (the exact locality, supply any landmarks of GPS information if possible). Polhill, R. M. (1982). 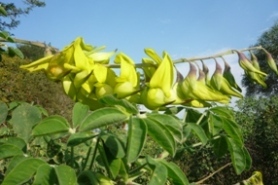 Crotalaria in Africa and Madagascar. A.A. Balkema/Rotterdam.